This series is massively popular in Japan and America and the DVD series makes it’s way here, gaining the following that it has internationally. This version is the Uncut version that didn’t make it to the American market, which is fortunate as it contains both the Japanese and English language dub. In this disc we see Naruto and his gang, including his sensei Kakashi are assigned to take Tazuna who is a master bridge builder to the land of waves. Thinking the job is simple enough, they come under ambush from a group of ninjas and then the insanity really begins. The emphasis for the young group is teamwork and Kakashi puts the group through a series of tests to build upon this. The action sequences are enjoyable in this flick and you can’t help but like the characters. The animation is similar to the style of DragonBall Z and is very colourful. It’s the sort of look that initially you would think the kids would like and over in the States it’s been edited to the point that it is just that, a kid’s show. I must admit that I felt somewhat lost watching this disc as this is the first volume that we have watched and I got the feeling that a lot more character development went into the first volume of the series. 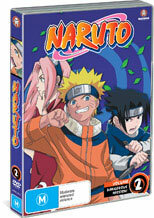 I’d like to recommend this series as it is a lot of fun and Naruto is a blast. Make sure you do get volume 1 though in order to get the most out of it.